So, I was delighted to be invited along to speak about my.Lboro at Loughborough's Programme Presidents meeting last week. Programme Presidents are a new group which has student representatives from each of our Schools, and is shaping up to be a great way for the University to engage with students over the issues of the day. My thanks to Students Union President Rebecca Bridger and Vice President for Education Jayde Savage for their help and assistance with this, and feedback on my.Lboro developments more generally.Here's a copy of my slides for the Programme Presidents, for anyone who wasn't there and is curious about what we discussed. I've also thrown in some commentary in the remainder of the post below as the slides lean heavily towards graphics rather than bullet points. As an aside, it would be interesting to find out whether we are unusual in trying this sort of "focus group" approach to consulting over IT developments. 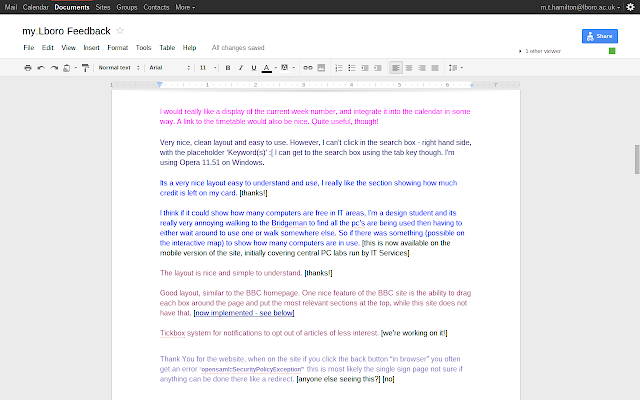 I have personally found it very successful, and also an intrinsically rewarding exercise as the students I have spoken to have been full of ideas and enthusiasm - lately around my.Lboro, and previously for our cloud email evaluation and subsequent Google Apps migration project. I would encourage University support services and departments to reach out to their students through groups like this - you won't regret it! 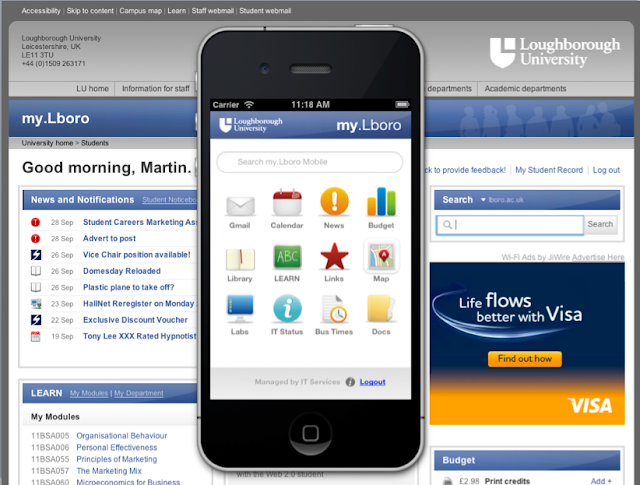 I've pulled out a screenshot of the my.Lboro site from my slides, as shown below. You can see that our production values are pretty high - for this I must thank Jonathan Walters and Ben Spencer in our Web Team, who came up with a top notch concept for the site and subsequently worked up a prototype for us using sample data. We were still left with the challenge of writing the connectors to the various institutional IT systems to put students' own information onto the site, but it would have looked very different if the design had been done by programmers. You'll note the mobile version of the site, shown here on an iPhone emulator. We felt that it was important to "launch" my.Lboro with a good mobile experience from day one. Right now if you visit the site from an Apple or Android device you will be redirected to a mobile optimised version of the site. We are also working on packaging the site up as an app, with the aim of using this to display not just the personalised content shown above, but also some general information about the University for visitors, open days etc. There's a fighting chance that we will have something ready for this Summer's Olympic visitors (Loughborough is playing host to both Team GB and the Japanese Olympic Team), but I am making no promises! 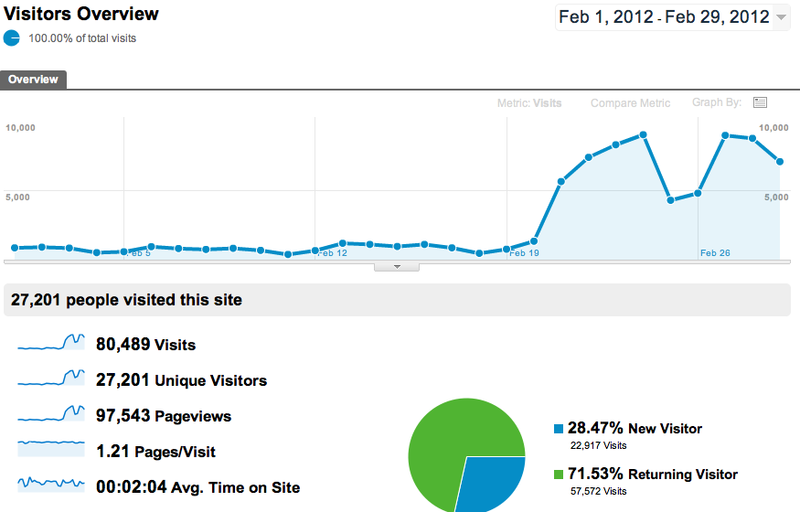 You may also have spotted an advert for Visa on the site. We have been working with JiWire, a leading Internet advertising broker, to test the water and see whether there is significant interest in advertising to students. As you might imagine, this has been quite a project in itself, requiring legal advice and top level sign-off by the University's senior management team. Many thanks to Des Burley from SGH Martineau for the legal assistance. Peter Jones, Mark Hindmarsh and Trish Tarson from JiWire have done a great job of taking us under their wing and explaining the mechanics of the Internet advertising industry. We also had some wonderful feedback from student focus groups and the Students Union Executive, without which we would not have contemplated an advertising pilot. Following that student steer our aim is to use the advertising income to support further development of my.Lboro, and also to return a significant sum to students - probably through Loughborough's Student Hardship Fund. 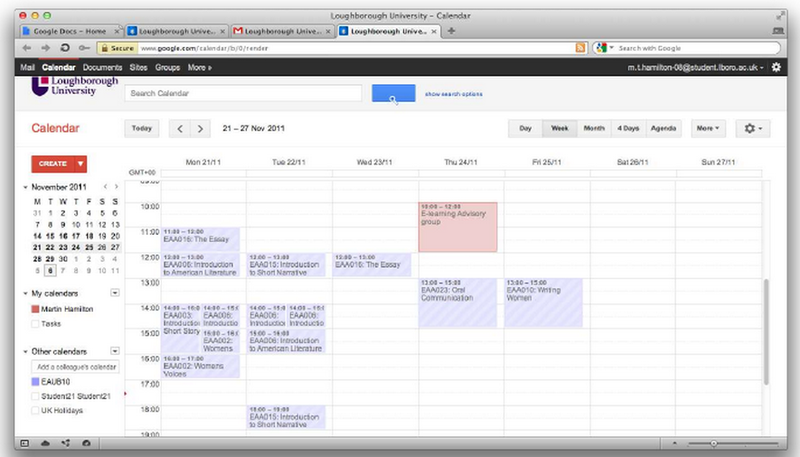 We have been trialling my.Lboro over the Autumn Term at Loughborough, and recently went fully "live" with it. by this I mean that we are now deliberately steering Loughborough students to the my.Lboro site through links on our main website and desktop shortcuts on centrally managed PCs. The Google Analytics graph below shows the moment when we made this change, and the number of sessions per day went from around 1,000 to some 10,000. 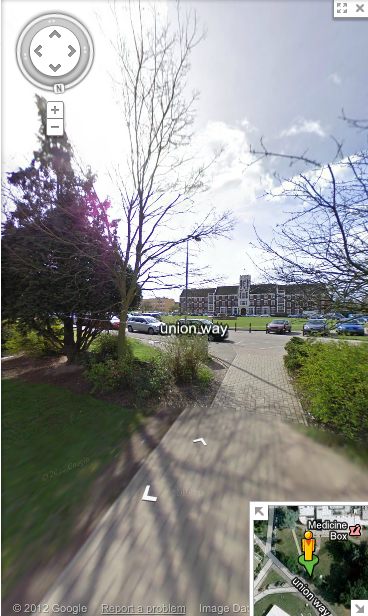 Loughborough students had previously been directed to the iGoogle service provided as part of our Google Apps domain, and we had gone to considerable lengths to publicise the change that would be taking place as we moved from iGoogle to my.Lboro. I was very relieved to see that this passed without incident, and indeed nearly a month on we have only had a couple of helpdesk cases that have been in any way related to my.Lboro. To be sure, I asked the Programme Presidents how they felt we had handled the transition, and it was gratifying to hear that everyone felt we had done a good job. I mentioned above that I feel there is much to be applauded about groups like Loughborough's Programme Presidents as a way of creating a positive feedback loop between the student body and the institution. A case in point here is the previous Programme Presidents meeting, at which Ruth Stubbings from our University Library presented on Library developments and solicited feedback from the Presidents on the Library's priorities. 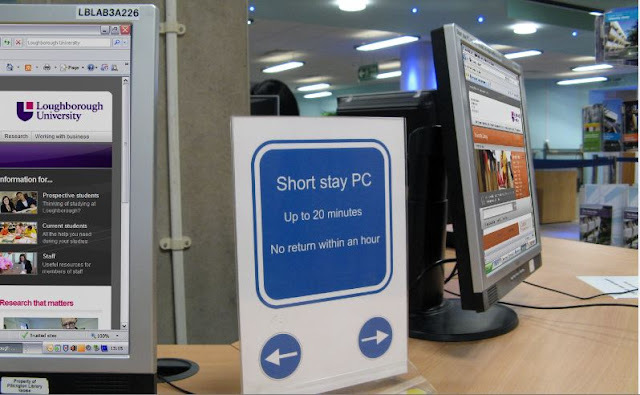 One of the key issues for students was that in spite of the Library providing around 150 open access PCs, it was often difficult at busy times for students to find a machine - even just for a few minutes to submit a print job. Having heard this, the Library acted quickly to provide a trial "Short Stay PC" area, as shown in the photo below. The Library had asked me to follow up this discussion, and I was very pleased to hear that all of the Programme Presidents present at the meeting were not only aware of the Short Stay PCs, but had actually used them and were very supportive of this approach. We also talked about a range of developments to improve student services that IT Services had undertaken in recent months. Examples of this included online re-enrollment for students (replacing long queues and a "big bang" approach to re-enrollment) and the ability for students to update their details online - as shown in the screenshot below. We had also undertaken a major programme of investment in infrastructure, much of which touches students directly - e.g. a complete replacement of the campus network infrastructure, further improvements to wireless coverage, and the upgrade of the University's JANET connection to 2 x 10 Gigabits/second. The Programme Presidents were very impressed with this programme of work, and we were particularly commended for the online self-service facilities. Obviously Universities are not online stores, and there will always be limits to the extent that we can emulate the likes of Amazon, but I feel that we are getting much closer to a coherent set of online services for students. In our discussion of network infrastructure I found it very interesting that some of the Programme Presidents mentioned wireless coverage problems in one of our halls of residence. This wasn't something that I had been aware of, and it made me wonder whether we have provided sufficient feedback channels and adequately publicised them. Or perhaps people have been subconsciously "taught" to assume that clicking on feedback forms on websites is a waste of time, from their experiences of dealing with consumer Internet service providers. I also took the opportunity to spend a few moments talking about the eduroam service, which Loughborough operates for the UK on behalf of JANET(UK). Many people weren't aware that this would provide them with a free high speed Internet connection at over a hundred University and College sites around the UK. The best part about this for Loughborough users is that it works using your existing wireless network settings, because we advertise eduroam as our wireless network for staff and students. You can see from the coverage map below that eduroam has really taken off - you may find that you need never pay for wireless Internet access again! 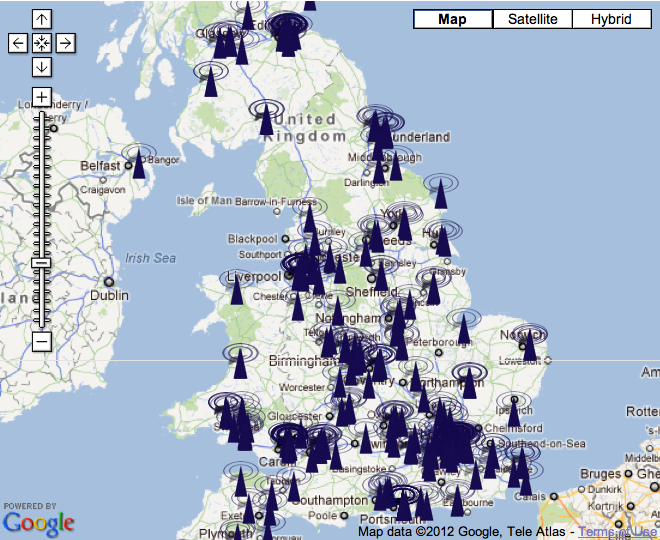 More information on coverage is available from the JANET(UK) eduroam site. Going back to the Google privacy debate, I wondered how people would feel about the Google StreetView imagery that we now have available for the Loughborough campus. This was the result of a week long cycling marathon around campus for the chap pictured with the StreetView trike below. It was interesting that when I put this slide up people readily volunteered anecdotes about how useful StreetView had been for arranging places to meet and finding one's way around our huge (437 acre) campus. I'm pretty sure that the 1,500+ Olympians and Olympic volunteers coming to Loughborough this Summer will value it too. 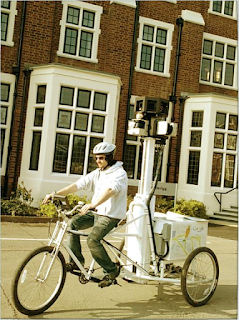 On a more serious note I think the general support for the StreetView project is indicative of something wider around trusted brands for Internet services. Whilst certain sections of the media and some politicians are bent on portraying Google negatively, for people like our students who use their services every day they are a trusted brand and a pillar of everyday life. The unification of Google's privacy policies has been presented by some as a sinister development, but this work was sorely needed and unravels a situation that was unhelpfully complex for both the firm and its users. 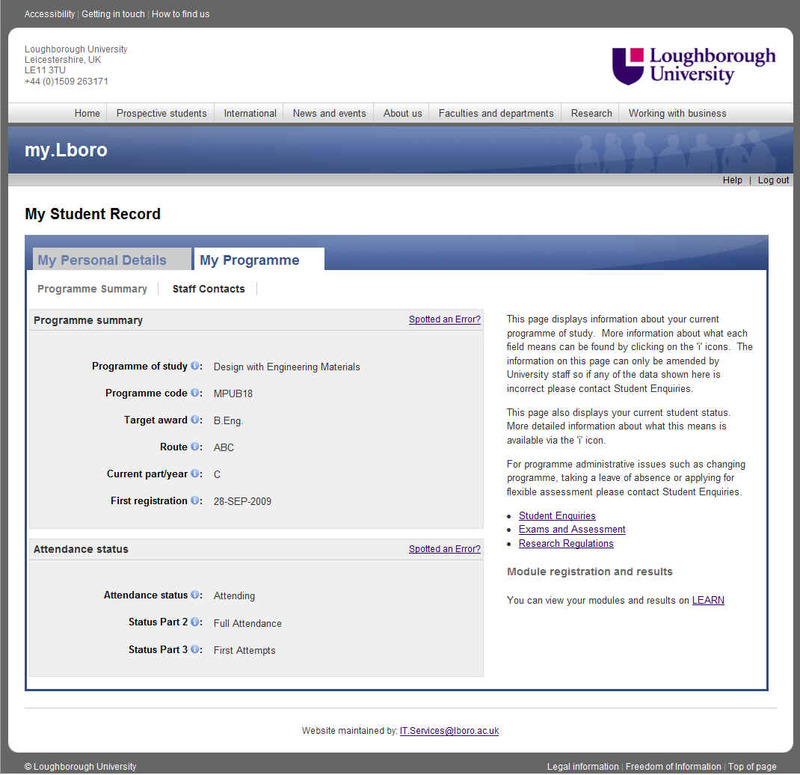 I thought it would be good to let our students have the final say, so here is a screenshot of the shared document that we have been using to collect people's feedback on the my.Lboro site. It's easy to be cynical about something like this, and you might assume that if you put up a document that anyone can scribble on then people will daub it with "Internet graffiti" - perhaps some LOLCats and a Kony2012 parody? :-) However as you will see below the quality of the feedback has been extremely high, and we have been inundated with suggestions for improvements and further developments. 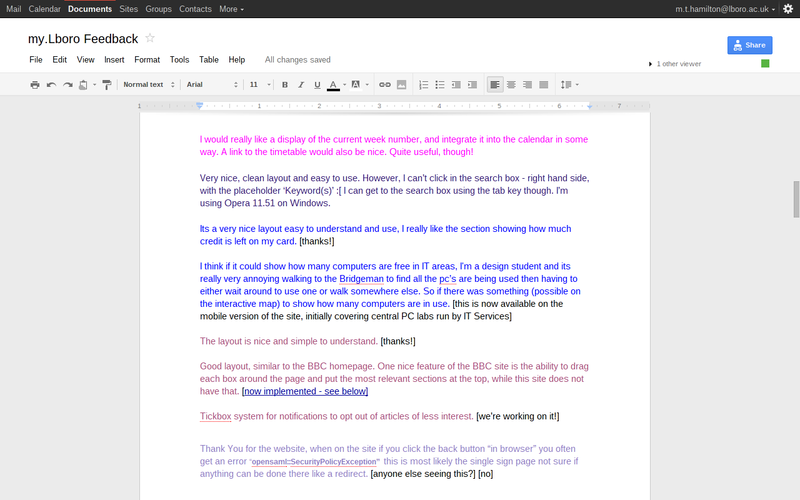 So, I'll close by extending my thanks to the students who have given us feedback on the site - cheers, guys! PS The Programme Presidents meetings are another open process, and you can view meeting minutes and membership at the Loughborough Students Union website.